Thyroid diseases are common worldwide and India is no exception. The prevalence of hypothyroidism (low levels of thyroid hormone) in India is around 11%. It is one of the key factors that lead to hormonal imbalance and weight gain. As most people might be aware of, hypothyroidism is more prevalent in women than in men. Along with diet, lifestyle, and medication, yoga can also help you manage thyroid problems. Yoga For Thyroid Problems: How it Helps? Yoga is one of the oldest healing techniques known to help control various health problems such as back pain, hypertension, stress, etc. The various yoga asanas that involve stretching, twisting, and compressing, stimulate the thyroid gland and aid in the release of the hormone thyroxine, thus helping you to develop a healthy metabolism. However, you should consult a doctor before you start practicing yoga to know if you can perform the asanas and the type of thyroid problem you are suffering from. Get Your Thyroid Profile Done @1mg Labs! 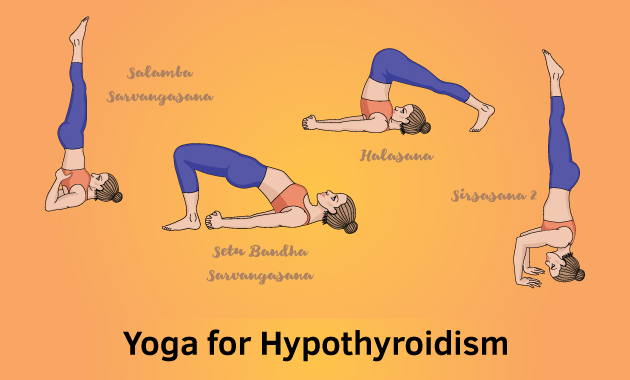 Akshar, Founder & Chairman, Akshar Yoga lists some of the common Yoga asanas for hypothyroidism. Sarvangasana helps in stimulating the thyroid gland and control the production of the hormone thyroxine. This asana increases the blood flow from the legs to the head helping to manage thyroid problems. How to do Sarvangasana: Lie on a mat with your legs stretched outwards. Raise your legs slowly such that the sole of the feet is facing the ceiling. As you raise your body, place your palms on your waist so as to support your back and hips. As you do so, make sure your elbows are touching the floor. Lock your chin into your chest and breathe slowly. Hold this pose for as long as you feel comfortable and return slowly to the starting position. Halasana stimulates the abdominal and thyroid gland as it compresses the neck. It helps calm the brain and reduces stress and fatigue. The posture itself resembles the Indian plough and is therefore called Halasana. How to do Halasana: Lie on your back on a mat. Place your arms by your side and bend your knees such that the feet are flat on a floor. Raise your legs slowly from the hips and place your hands on your hips if you need support. Bend your legs slowly at the hips as you try to touch the floor behind your head. Place your hands on the side, exhale and hold the position for as long as you can. Gently return to the lying position and inhale as you come down. Matsyasana stretches your neck and stimulates the thyroid gland. Moreover, it also lowers the stress level and reduces the stiffness of muscles and joints. It helps in relaxing the body and preventing mood swings and depression experienced by thyroid problems. Losing Work-Life Balance..?? Here’s The Right Medication.!! How to do Matsyasana: Lie on a mat with your feet flat on a floor. Place your arms on your sides and raise your hips. As you do so, place your hands under each hip, one at a time. Bend your elbows and push your body up such that only your chest is raised and tilt your head back. Hold the pose for five counts and return to the starting position. Setubandhasana helps in stretching and thereby stimulates the thyroid gland to produce thyroid hormones. It also reduces anxiety and improves the digestive system. How to do Setubandhasana: Lie on your back with the knees and feet flat. Keep your arms on your sides such that the palms are facing the floor. Use your arms to push your hips off the floor such that the neck and head are on the floor and the rest of the body is in the air, similar to a bridge. Hold this pose for five breaths and slowly return to the normal position. This asana acts directly on the thyroid gland and improves the functioning of the gland. It also improves blood circulation to the brain and make the body alert and properly perform metabolic functions. How to do Sirshasana: Position yourself such that your knees and hands are on a floor. Stretch your spine slowly by moving your head up and down at a gradual pace. Now place the top of your head on the floor such that it lies in between the hands. Move your legs close to the chest and transfer your weight on the head and hands. Now gradually raise your feet one after the other such that the body is fully erect in an inverted position. Take a deep breath and hold this position as long as you feel comfortable. Slowly bring your legs down to reach the starting position. Note: Do not perform these asanas if you have a back or neck injury. Always consult your doctor before starting any yoga asanas. If you are a beginner, then it is wise to get a professional help. Hypothyroidism: Are You Making These Common Mistakes With Your Medication? 1. Nair A, Jayakumari C, Jabbar PK, et al. Prevalence and Associations of Hypothyroidism in Indian Patients with Type 2 Diabetes Mellitus. J Thyroid Res. 2018 Aug 9;2018:5386129. ← Hemorrhoids: How To Prevent And Manage Piles?